Mon-Fri: 5:30 a.m. – 10:00 p.m.
Saturday: 7:00 a.m. – 8:00 p.m.
Sunday: 7:00 a.m. – 5:00 p.m.
Mon-Fri: 5:30 a.m. – 9:00 p.m.
Saturday: 7:00 a.m. – 5:00 p.m.
Sunday: 7:00 a.m. – 4:00 p.m.
All memberships are offered on a monthly basis. Please see below for pricing effective March 1, 2018. Proof of residency is required to qualify for resident rate. Village/Corporate rate applies to those who live in the Village of Tinley Park but outside the Park District boundaries, and those who work within the village. Proof of residence and employment status (current pay stub) must be provided. Registration Fee Includes: Member orientation to center and equipment and two free guests passes. Please note: current membership rates are for new memberships only. Those that purchased a membership prior to the date listed above will continue to pay the monthly rates they have been as long as their account remains in good standing and no lapse of membership occurs. Please ask at the front desk for more info. Click here for rates, hours and pictures of Camp Tinley child care center! 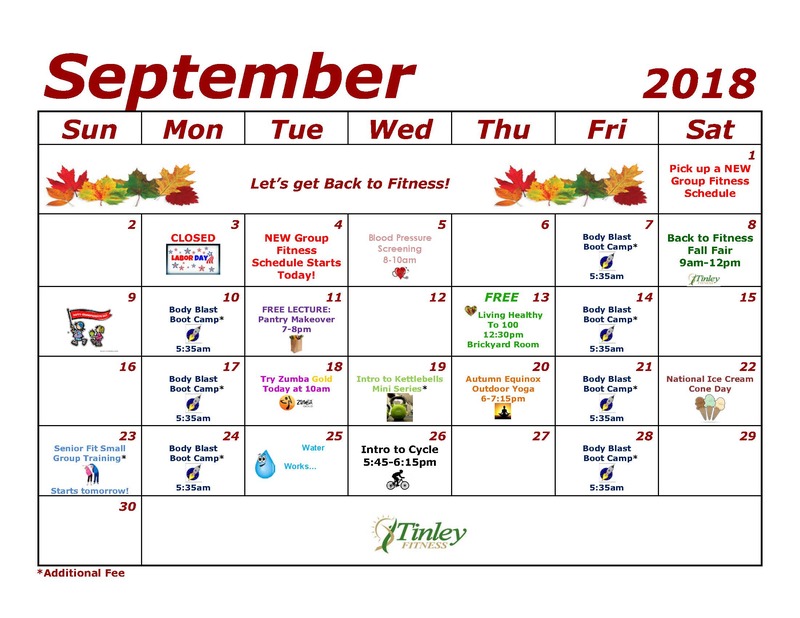 From time-to-time Tinley Fitness offers “New Member Specials” for people registering for a new Tinley Fitness membership. There is no New Member Special being offered at this time. Group Cycling Classes Now Offered! Tinley Fitness now offers Group Cycling classes. Check the group exercise schedule in the left column for the most-current Group Cycling schedule. There are over 30 classes per week for members of all ages and abilities. Choose from Strength, Step, Zumba and more! 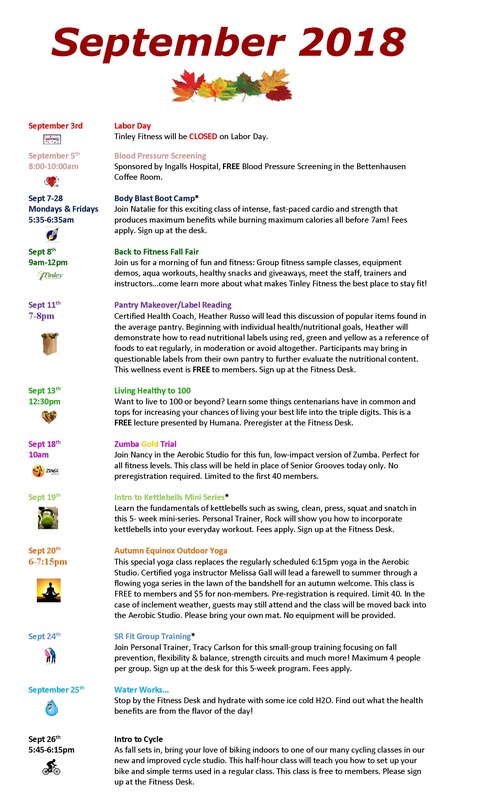 Select classes are FREE with your membership. See our current Group Exercise Schedule at the top of this page. We’re making waves! Our 4-lane, 25-yard lap pool offers 17 Aqua Aerobic classes per week. Recreational swimming or serious lap swimming is a non-impact exercise choice. See our current Pool Schedule at the top of this page. Whether your goals include weight loss, improved health or athletic performance, our Certified Trainers will teach you techniques to maximize the benefits of your workouts. What’s keeping you from taking your fitness to the next level? Day, evening and weekend appointments available. Private swim instruction is offered for those 18 months through adult. It’s never too late to learn to swim. Swim lessons are one-on-one with an instructor. Click here for info on Birthday Parties at Tinley Fitness!